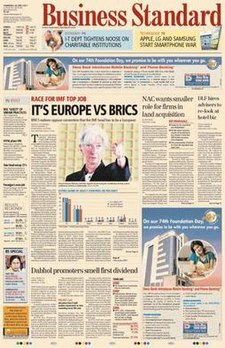 Business Standard is one of the largest Indian English-language daily edition newspaper published by Business Standard Ltd (BSL) in two languages, English and Hindi. Founded in 1975, the newspaper does extensive coverage on the Indian economy, infrastructure, international business and trade, stock and currency markets, corporate governance, apart from a range of other financial news, opinions and insights. The main English-language edition comes from 12 regional centers, Mumbai, New Delhi, Kolkata, Bengaluru, Coimbatore, Chennai, Ahmedabad, Hyderabad, Chandigarh, Pune, Lucknow, Bhuvaneswar, and Kochi—and reaches readers in over 1,000 towns and cities across India. The paper had remained for years, India's second largest business daily in terms of circulation, until in 2017, when its ranking sank. As of January, 2019, it is adjudged by the Indian Readership Survey to be the third largest selling financial news daily (by Total Readership of 505,000) and the fourth largest (by average issue readership of 107,000). Noted financial editor T. N. Ninan was the Editor from 1993 to 2009, when he took up the editorship of The Economic Times. In January 2010, Ninan became chairman and editorial director of BSL and was succeeded as editor of Business Standard by Dr Sanjaya Baru. Baru was the media advisor to Prime Minister Manmohan Singh. Veteran journalist and editor Ashok K Bhattacharya took charge of the paper after Baru quit to join a UK based think tank in 2011. The current editor is senior journalist Shyamal Majumdar. More than 200 business journalists are currently employed with the publication. The offices with the largest bureaus are in Delhi, which mostly covers policy news and Mumbai, mostly dedicated to corporate and financial news. However, other offices with reporting bureaus are present across the country, including in Kolkata, Bangalore, Ahmedabad. The newspaper has reporters in other major cities such as Chennai, Bhubaneswar, Lucknow and Chandigarh. Arvind Singhal, chairman, Technopak Advisors. ^ Staff, Edit (4 August 2009). "Corrected: Business Standard Owner Uday Kotak Held Meetings With Potential Buyers". gigaom.com. Retrieved 27 July 2018. ^ Business Standard. "About Us - Brand - Business Standard". ^ "The Economic Times is number 4 among English newspapers: IRS 2017". ^ "AK Bhattacharya replaces Sanjaya Baru as Editor of BS". ^ "Author-Shyamal Majumdar-Business Standard-Page 1". Business Standard. ^ "- My gaharwar ji". www.gaharwarji.com. Retrieved 2019-02-23.